10:55pm The live feeds return. Bedroom. Lolo, Ricky and Tamar. Ricky has the HOH room key around his neck. Ricky won Head of Household! Tamar – I was so tired. I didn’t get scratched up .. no wait I did! Lolo – that was a crazy day .. from last to first. 11pm – 11:20pm Ricky – Kandi shouldn’t have called me out that one time. Lolo – she shouldn’t have done it. She shouldn’t have done it on an eviction block. Ricky – yeah. Lolo – she shouldn’t have done it on an eviction block. You saw my speech. One I knew I was low key kind of safe. AND I STILL was nice to Tom. You know. But thats just because I knew it could have flipped at the last minute… even though you said it couldn’t have. And two that’s a big platform to misuse. In my personal opinion. Ricky – yeah. She better win the veto or she is going home. I mean unless you guys save her. Tamar joins them. Tamar – on so many levels this was your game. Ricky – Kandi is in trouble unless you guys save her. I need your permission though. Tamar – you’re HOH. Ricky – she called me out two times. She said I don’t believe in alliances because they always backfire. Lolo – how are you going to feel being in the HOH? Ricky – I’m not staying up there. If you want it, you got it. Lolo – that room is toxic. What an incredible day. Ricky – you couldn’t have written a better script .. like for Tom to use the veto. I put a bug in his heart and I was just hoping it would eventually detonate. Lolo – what was it? Ricky – just dropping … like Tom I really did give him sound advice. Like over and over and over again. Some times it was a little rough. Lolo – what was the advice to get you off the block. Ricky – I think it was an accumulation. One of my teachers call it a wedgie. I would just drop truth bombs and eventually it just hit. It felt like he had to do something. Tamar – thank you Ricky for holding it down. Ricky – thank you for y’all for getting Tom up out of here. 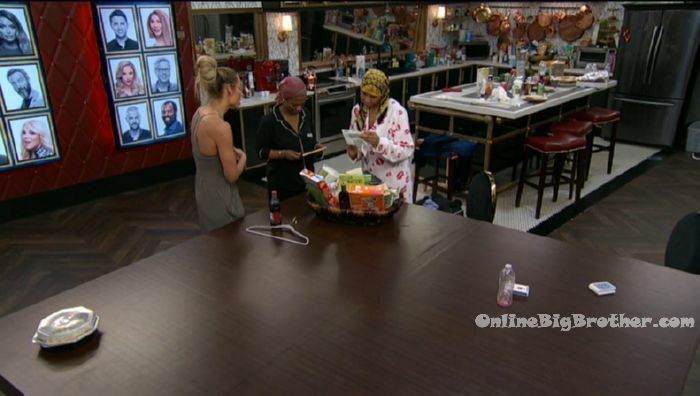 12:05am – 12:46am Lolo gets her HOH basket for winning the HOH during the double eviction. She reads her letter from her friend. Dina – this game is teaching me to be better at memorization. I’m not leaving this house until I win one competition. i’m not sure if it was on here, or down some rabbit hole. Someone asked why Ricky seems to have had a thing about wanting Kandi out for a while. I remember Kandi and Ricky chatting in the kitchen very early on in the game. Kandi was playing cards. She was telling Ricky she knew exactly what he was doing with his seed bombs and needling. He half denied, and she gave him face and said she didn’t care, as long as he didn’t think for one second of doing it with her. Ricky has been dismissive of Kandi and wanted Kandi out to his alliance members because she read him. The supposed Kandi shouldn’t have called him out excuse is just that. it’s an excuse. She saw his slithering early on and he’s been belittling her intelligence so nobody would believe her if she shared her thoughts ever since. Twitter seems to be debating whether Tamar would gun for veto and save Kandi, or let Kandi be evicted. Tamar has two final 2 deals. One with Ricky, one with Kandi. For some odd reason, I just don’t see Tamar doing anything that isn’t for the benefit of Tamar’s ego and Tamar’s back despite what the edit is telling us. Lolo crying because her hoh letter isn’t from a husband. My face is contorting as her whining becomes peanuts teachervoice in my head. Dina. oh god love a duck. Dina. Why would Dina be saying she’s the target when the double eviction just exposed the target pecking order? Jiminy Christmas. drunk adjacent or allergic to oxygen. I just don’t get her sometimes. most of the time. almost ever. Now, this might be a little bit out there, and it’s not going to happen but: Consider how many of the evicted people have said I hope you win it Lolo on the way out the door. They have GOT to know she has Nem’s vote. Tom’s vote after what he said at the door. and I believe there was another one, possibly it was Ryan. If you want to win, and you have heard half of the jury so far say they want Lolo to win…why would you allow her to get that far? That’s just not logical. If nobody on the way out of the house has said hey tamarickandina hope you win, but half the evicted are stroking the ego of the dimestore version of lauryn williams, only a fool would take her to finals. Oh my! You are spot on! I love every point! Cheers for the, tamarickandina! I’m a Kandi fan and still root for her. She is a classy lady. I am sickened by the way they compare who needs the money most. None are broke by any means. Dina filed bankruptcy last year and stiffed her creditors 13 mil. and still lives large. I did a really quick search of estimated net worths for each of the house guests this year once the financial need angle became a thing. from lowest to highest their ranking would be: Jonathan, Dina, Loco, Nem, Ricky, Kato, Tom, Joey, Tamar, Ryan. Add all of them together and you get to Kandi. Add all of them together and you get to Mooch. This is estimated with not only their assets salaries, endorsements settlement/judgements and fees, but also taking into account their mortgages on property and any loans. Every one of them is a millionaire (except Jonathan). I knew Kandi was loaded, and that Mooch was super loaded, but didn’t realize the pecking order. That’s very interesting and makes Loco’s “poor mouthing” even more ridiculous. I AM surprised Kato ranks above all of those and impressed. I’d say Dina does the best she can; she’s no Kris Jenner as far as business savvy and is ill equipped for this game, except it’s probably a good pay day just to participate. Also respect to Joey for managing his finances the way he has. I wondered what in the world Ricky was talking about Kandi calling him out. Now it REALLY makes sense. She’s got his number. I wanted to like him because I’m a huge fan of massages (LOL) but he rubs me the wrong way (no pun intended… okay, maybe a little). How did Kato get so much cash? OJ hush money? Oh and does anyone know how finale is going to work? If the mooch wasn’t really a player then I would assume he won’t be voting? But if there will be 3 at the end then it would be an even number of jury members without him. Not to mention I don’t remember there ever being 5 ppl on finale night? Someone will get evicted, on finale night there will be four. All four will compete for HOH. That HOH will send two people home leaving them and the person they want to take to final two with them. Julie said all 5 make final night but one will get evicted early. Then the last 4 compete. Last year they took 4 and Ross won the HOH and kicked off two. The Mooch will vote to make it an odd number. The game is still on? I thought it ended when Tom left. Nothing but dead wood in there. End this nonsense. Ricky, the real truth is that when Tom saved you – he was being the kind of person that you pretend to be. I can’t believe these guys can’t see how Ricky has manipulated them to do all the dirty work to get him to the end. I don’t think Tamara will save Kandi and if Ricky wants to win he should put up LoLo and Tamara and let them battle it out. I hope Tom wins America’s favorite. Keeping fingers crossed for Kandi. Tamar is as immature as they come. So glad the finale is almost here. I seriously cannot watch or listen to LOCO and Ricky for one more second congratulating themselves on being amazing people and how they were so gracious to the Evil Tom who eats small children in his breakfast cereal. I’d say that I can’t wait for them to see how they looked on national television, but people with that little self-awareness will still fail to see what is smacking them in the face. Kandi is a goner. Tamar will celebrate stabbing her in the back with a shout-out to God for striking down his lightning on her nemesis. Another member of the Lack of Self-Awareness Trio. I’ve never been a fan of production overreach, but if they hand the next HOH to Dina, I would give Grod a pass. Dina will win in the final two against any of these a-holes and it would actually be a great finish to the season. The person I least expected to like in the house was the most normal and wins. Tamar called tom a bully. Yet she danced in front of him when he was evicted. Tom handled everything with humility and class. Tamar and ricky are the real snakes of the season. If anything, (C)BB brings out the “real” person of the individuals. Not a pretty sight whatsoever this year. It’s really been an absolute flop and the game play has been atrocious. The SJW’s in the house this year are quite something to watch. The usual mean spirited, hypocritters that they are. I think every comp from now until Tamar is gone should be a haunted house themed one lol. I am rooting for Kandi now, although I think she might get backstabbed by Tamar and voted out next unless she wins Veto. As much as I don’t care for the remaining players, if Rickie put up Kandi and Dina and Tamar won Veto and used it on Kandi. Lolo goes up and Tamar and Kandi vote out Lolo would be funny. I think the only way Lolo makes it to final 2 is if she wins to decide who goes with her to final 2. How did we get these people as the final 5!!! when Lolo goes home she’s going to be really lonely after living with so many people. I don’t like her game play or how she talked about Tom and Kato, but I still feel sorry for her. I know this may be a foreign concept for many, but sometimes, just sometimes, people have to take responsibility for their respective personal circumstances. Loco is certainly one of those. She has been a vile, anger filled person since day one. Look how she treated Ryan, who did ABSOLUTELY nothing to her and he is a decorated Olympian that she personally knew before the show. Really exposes her ugly character and is probably why she finds herself with no one around her. Nothing to feel sorry for. I feel sorry for the people she has run over in the past, no doubt that has happened on many occasions.